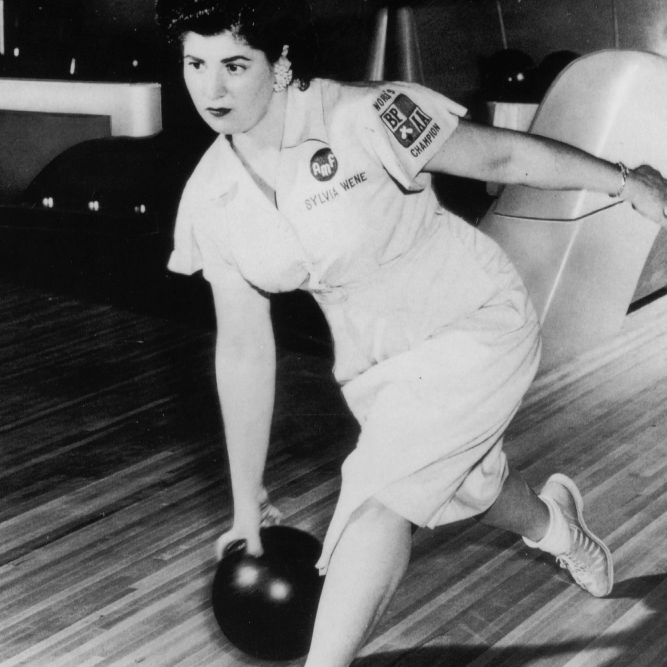 Sylvia Wene Martin is known as one of the greatest women ten pin bowlers in history. A winner of numerous bowling crowns, she was the first woman ever to rack up three perfect or 300 games in sanctioned competition. She rolled her first perfect game in March 1951. Almost nine years later, in December 1959, she was perfect again. This time it was during the finals of the World Invitational Match Game Tournament. It was the first perfect game by a woman in match play. In January 1960, she hit the bowling trifecta with a third perfect game in the qualifying rounds of the Bowling Proprietors Association Of American All State Tournament, which she eventually won. Martin twice captured the BPAA Individual Match Game Title, in 1955 and 1960. Both years she was named Woman Bowler of the Year by the Bowling Writers Association of America. Her records include the all-time high league average of 206 and the most three-game 700 series in a career, 14. She is a member of the Women’s International Bowling Congress Hall of Fame and the International Jewish Sports Hall of Fame.